To induct students into the National Honor Society for Dance Arts™ (NHSDA), your school or studio must host an active NHSDA Chapter. Individual students, not enrolled at a school that hosts a current NHSDA Chapter, are not eligible for induction. You can learn more about starting a chapter here. Ensure that your students have met the requirements for induction. You can use the NHSDA Student Induction Rubric (found in the Chapter Sponsor Handbook) for this purpose. You do not need to submit this form to NDEO, but you should maintain it for your own records. Direct your students to apply for induction on this website. They should go to the Student Application page, then search for their chapter using the interactive map or by entering the institution name or city and state. After selecting their chapter, they will click on the "Apply" button. The application asks for basic contact information as well current grade level. You will receive email notification when a student has applied for induction. You can then log in to this website (www.nhsda-ndeo.org) with your username and password to approve students for induction. After logging in with your username and password, click on Control Panel link under your name in the top right hand corner of the homepage. Click on NHSDA on the Control Panel screen. Input the date of of the Induction Ceremony. 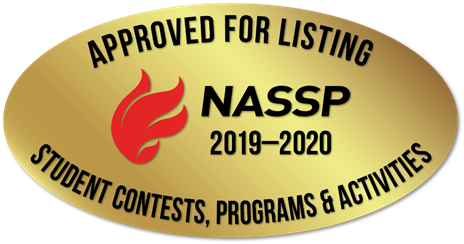 New this year: Determine how you want to receive the certificates and check the appropriate box: Sponsor printed certificates or NDEO Print and Mail certificates. Sponsor printed certificates are the less expensive option. The sponsor printed certificates include all necessary words and a colorful border and can be printed via a color printer on plain paper or cardstock. The default is set for PYO, if the Chapter Sponsors would like to switch it to NDEO Print, please be sure to check the correct box when inducting or change the setting on your profile. Click on the students in the list who have met the qualifications for induction and input their GPA and points earned. Below the list of names, you will be able to add pins and cords to your order. Once you have added the correct number of pins and cords (optional step), click Save to record the induction and place your order. You will be redirected to www.ndeo.org and automatically logged in, to pay for the induction fees and any pins and cords that were added to your order. If for some reason your computer does not redirect you to the NDEO website, then click on the orange "Make Payment" button and you will be automatically logged in to your NDEO Institutional membership. Once on the NDEO website, look to the top right hand corner and click on the drop down menu under your name. Then click on the Payment Due link. If you selected the option to print your own certificates, these will be available in your NHSDA dashboard. There will be a certificate icon next to each inducted student's name. The default is set to Sponsor Print, if the Chapter Sponsors would like to switch it to NDEO Print/Mail, please be sure to check the correct box when inducting or change the setting on your profile. Sponsor Print option allows the Chapter Sponsor to immediately have access to their student's certificates after NDEO has received payment. There will be a higher cost and a longer lead time if the Chapter Sponsor would like NDEO to print and mail the Induction certificates to them. Distribute the certificates at your induction ceremony or another appropriate time.